You are looking to start a new project or simply clean up your yard, and you know that our clean-up service is what you are looking for. How does this process actually work? Our website details all the different services we provide, and once you decide on what you need, the process is simple to use. Here is an easy list to follow to use our service and get your junk removal on its way. Making an appointment with us is easy; call or use our website to make an appointment day and time that works best for you. We will call you 15-30 minutes before this scheduled 2-hour appointment window to make sure we arrive on time when you need us. During this meeting, one of our friendly team members will meet with you to see the details of what service you need and inform you on how the process works. This appointment is obligation-free, so if you decide our service is not for you, then there is no need to pay. After receiving our competitive price quote, you can decide if our junk removal service is the one you need. Our affordable prices are based on volume and weight, based on what will fit in one of our trucks. Show us what you want to dump so we can estimate and give you an all-inclusive price based on your needs, no matter what you decide to drop. 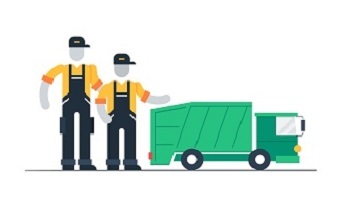 If your project is ongoing and you want to have a place to dispose of debris, ask for our dumpster rental service so we can bring our dumpster to your site, and you are aware of the prices we offer. You have decided on the best course of action and wanted to use our hauling and removal services. Point us in the direction of the garbage, and we will quickly and efficiently remove the waste where it sits, whether that be in your home or the backyard. We will remove the waste for you and sweep up after ourselves so it will be as if we were never there. Having to drag your old couch or haul your wood scraps and drywall in multiple trips in the back of your truck are a thing of the past! Once we remove all of the debris and junk from your residence or business, we make sure everything that can be recycled or donated is taken care of before we dump the rest. We are a responsible and caring company and want to make sure everything that can benefit our community as a whole is done. You will not have to worry about any of your waste once we pick it up. Everything will be taken care of quickly and correctly. We are working to help keep as much junk out of the landfill as possible while still meeting all of your garbage disposal and trash removal needs. Let us take care of your junk removal today!